The Khlong Saeng-Khao Sok Forest Complex covers 5316 square kilometers and parts of Surat Thani, Phang Nga, Ranong and Chumphon provinces. It includes Khlong Saeng, Khlong Yan, Khlong Naka, Khuan Mai Yai and Ton Pariwat Wildlife Sanctuaries. Khao Sok, Kaeng Krung, Lam Son, Sri Phang Nga, Khao Lampi – Hat Thai Muang, Khao Lak – Lam Ru and Khlong Phanom National Park are part of the complex. Almost 50 mammal species have been recorded within this area. Here are some of them. The Asian or Asiatic elephant (Elephas maximus) is distributed in Southeast Asia from India and Nepal in the west to Borneo in the east. Asian elephants are the largest living land animals in Asia. Since 1986, the Asian elephant has been listed as Endangered on the IUCN Red List as the population has declined by at least 50 percent over the last three generations, estimated to be 60–75 years. The Asian elephant is primarily threatened by loss of habitat, habitat degradation, fragmentation and poaching. In the Khlong Saeng – Khao Sok Forest Complex there are probably still wild elephants but their numbers seem to have declined. We don’t know of any sightings of this majestic animal in the wild. You will so-called domesticated elephants during your visit to South Thailand. 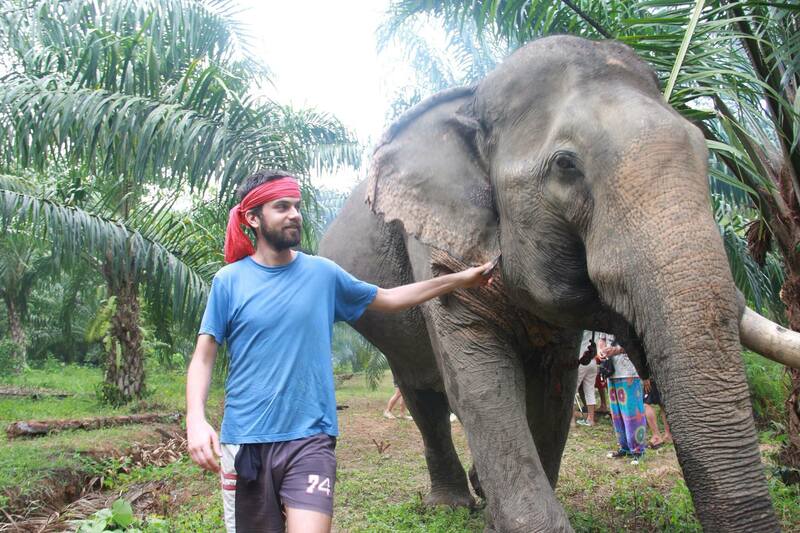 Our Khao Sok Elephant Experience gives you the opportunity to meet one of them upclose. The Barking deer is the most common species of the deer family in Thailand. It is found throughout the country as well as throughout Asia. 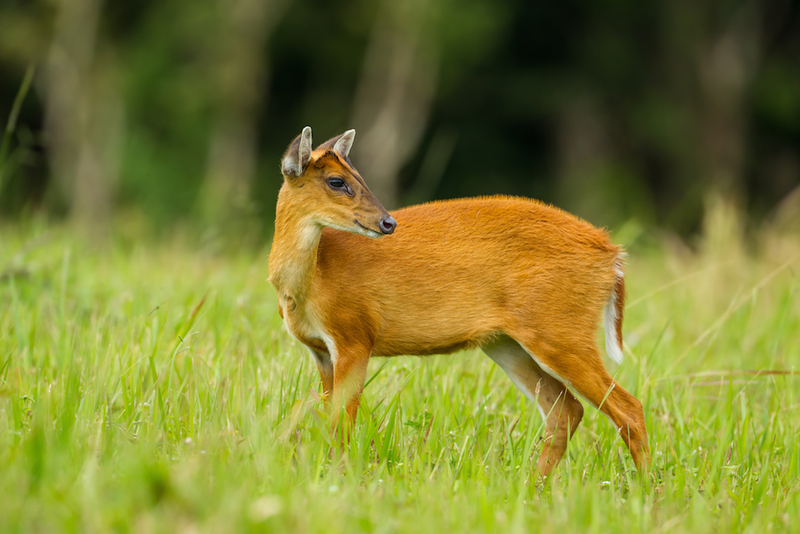 It is also called the Common Muntjac. Why is it called barking deer? When it senses a predator or danger, including humans walking in the forest, it will send out a warning call to others that sounds like a high pitched bark. It is a very cautious and shy animal. It can be seen on the forest margins especially at dusk and sunrise, systematically deciding if there are dangers around. Barking deer are a major prey species for tiger and leopard in national parks and wildlife sanctuaries that still have the larger feline predators in Thailand. The dry season is a very good time to see them as they will also be quite active in the day, especially at water sources. There are regular sightings of barking deer in the Khlong Saeng-Khao Sok Forest Complex. 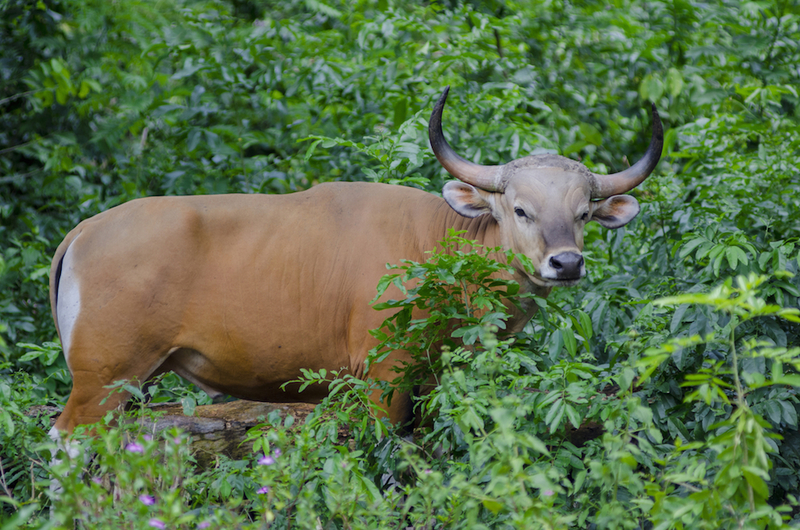 The Gaur is a vegetarian animal with a huge body weight supported by incredibly slim white legs, this large dark-coloured mammal is distinct from the banteng in that it has no white rump patch. They live in sparse forest where they feed on grasses, bamboo, fruit, leaves, and young branches. The Gaur is generally active both night and day, but in places where humans are common, they stick to the night time. Gaur tend to gather in herds of two to 30 members. Each herd contains only one adult bull. Khlong Saeng Wildlife Sanctuary has a Gaur population of about 100 individuals. It is one of the best reserves for Gaur due to the dense moist evergreen forest. Gaur are very shy and run away at the first sight of a human being. You can see them in Khlong Saeng but you need to be be very patient. It might take several days. The Tapir aka Malayan Tapir (tapicus indicus) looks a bit like a pig with a long snout but are not related to them. Tapir habitats are in southern and central parts of Sumatra (Indonesia), and on in Peninsular Malaysia. The tapir occurs in the Huay Kha Kaeng Wildlife sanctuary and other protected area in Central and South Thailand. 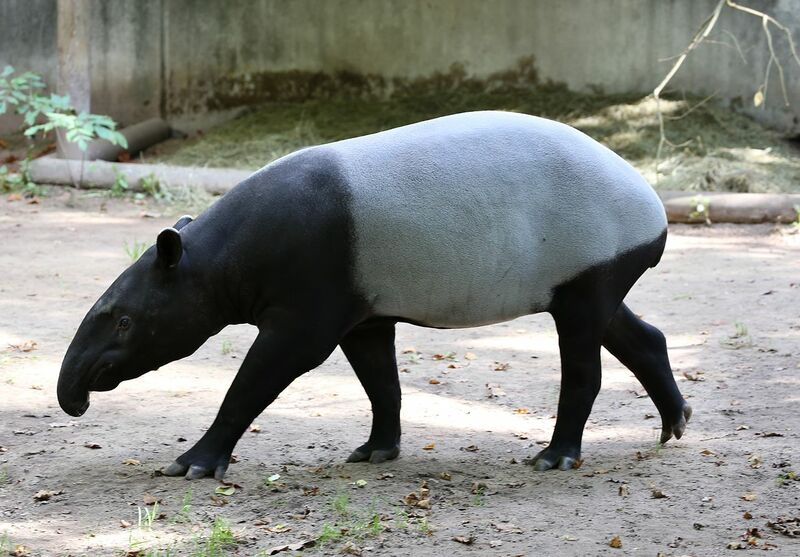 In Myanmar the tapir can be found in areas bordering Thailand but not in the North. Tapirs prefer to live in moist forested areas where there is a permanent supply of water. There have been sighting of Tapirs in Khlong Saeng – Khao Sok Forest Complex. Wildlife photographer L.Bruce Kekule made pictures of them. You have to be patient. The Malaysian Sun Bear aka the Malay or Malayan Sun Bear is the smallest bear species in the world. It height ranges from 1,2 to 1,5 meters, head to tail. It is only the only species of bear living in Khlong Saeng – Khao Sok Forest Complex. What are the threats to Sun Bears? First of all it is the large-scale deforestation in Southeast Asia. 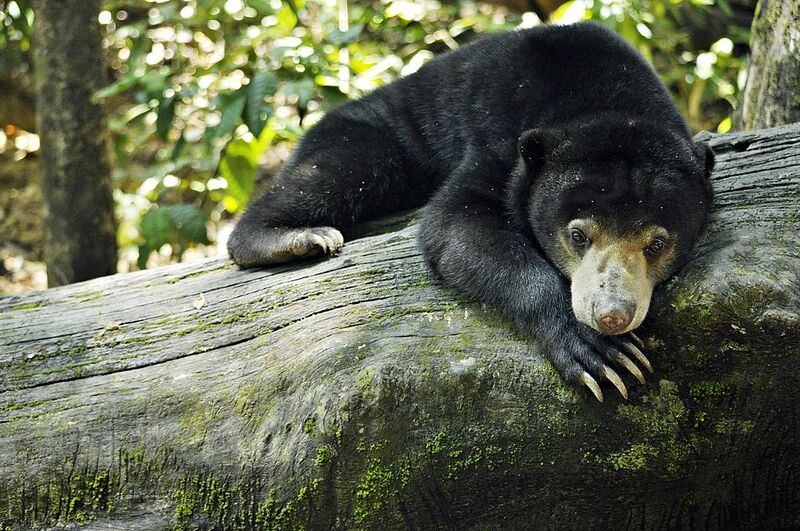 Sun Bears live in tropical forest, both rain forest and seasonal forest. Their habitat is being destroyed. The second threat is commercial poaching for the wildlife trade. Sightings of Sun Bears are rare. You have to be patient. Wild boar is also known as wild pig. It is a species of the pig genus Sus, part of the biological family Suidae. The species includes many subspecies. It is the wild ancestor of the domestic pig. Wild boar are native across much of Northern and Central Europe, the Mediterranean Region and much of Asia, including Japan and as far south as Indonesia. 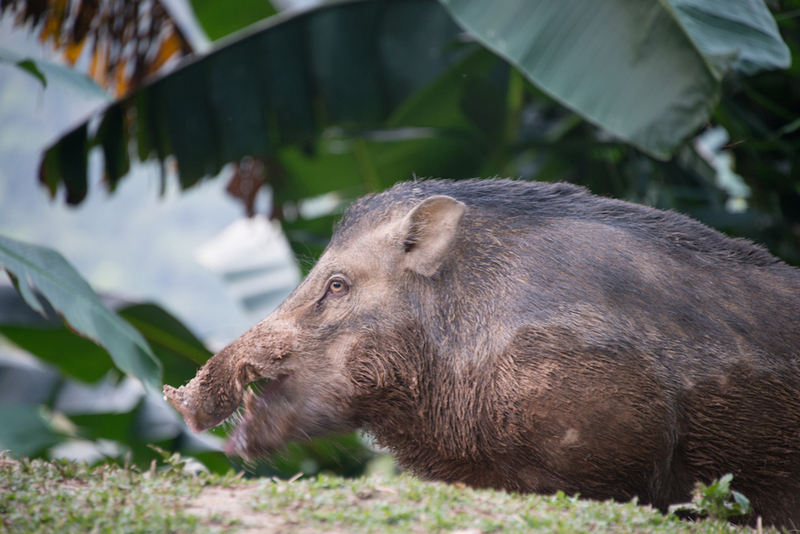 Wild boar can be found in many national parks across Thailand. Beware of this animal. Wild boar attacks on humans are not common but do occur occasionally. Usually, boars, like most wild animals, will avoid interactions with humans. When dealing aggressively with a human, boars will charge at them. Just run away in that case! Picture provided by Rushen Bilgin of Thai National Parks. The crab-eating macaque is also known as the long-tailed macaque. It is a primate native to Southeast Asia. It has a long history alongside humans. 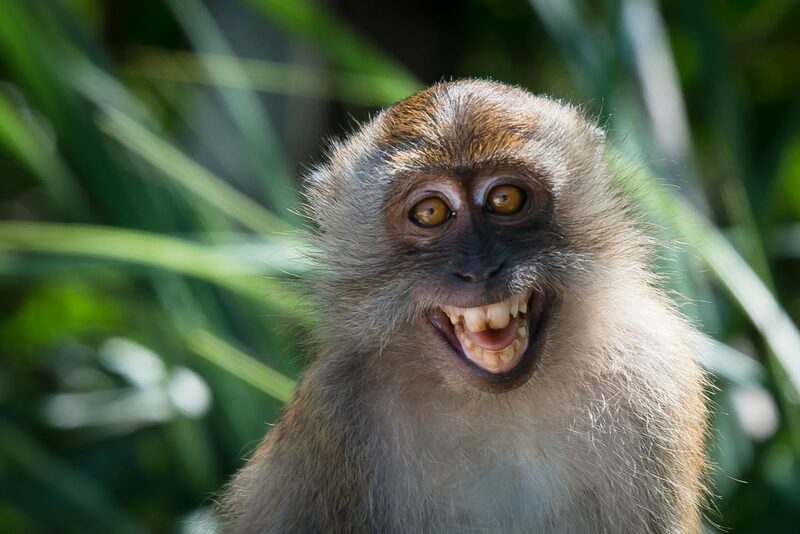 The crab-eating macaque lives in matrilineal social groups with a female dominance hierarchy, and male members leave the group when they reach puberty. These monkeys eat virtually anything. They have been documented using tools to obtain food in Thailand and Myanmar. They are quite easily spotted and are certainly not shy. The slow loris is a very cute animal living in Southeast Asia and bordering areas. At least 8 different species have been identified. If you happen to see one in Khao Sok National Park it probably will be the Sunda slow loris, names after the Sunda Island in Indonesia. This species is found in Thailand, Malaysia, Indonesia and Singapore. The slow loris is a primate. It is a night animal and feels at home in the trees. It is a very shy animal. It moves slowly. When it feels threatened it stops moving and remains motionless. All slow loris species are on the IUCN Red List classified as vulnerable or endangered. Loss of habitat and wildlife trade are the main threats. Lorises are popular as pets and are sometimes seen at tourist places being offered for photo opportunities. We think it’s better to leave them in the wild. 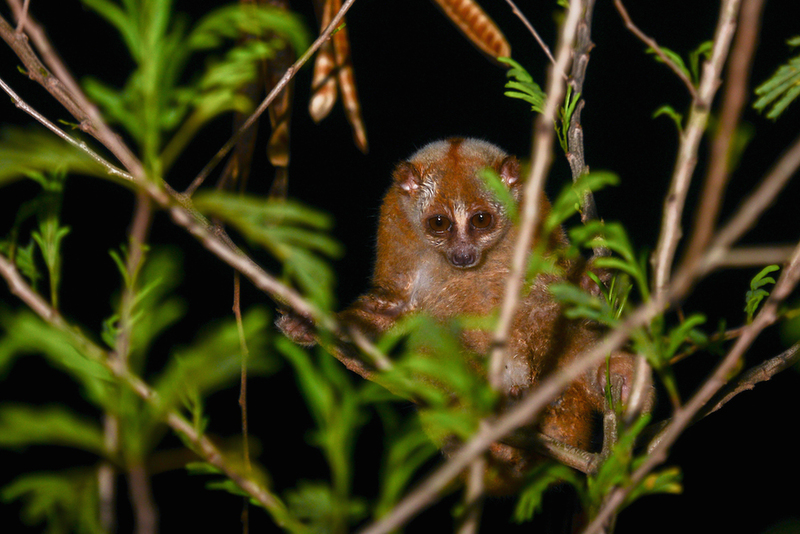 A slow loris has been spotted close to our Hornbill restaurant.